Redeemer is a member church of the United Church of Christ denomination. The UCC is a community of faith that was founded in 1957 as the union of several different Christian traditions: from the beginning of our history, we were a church that affirmed the ideal that Christians did not always have to agree to live together in communion. Our motto—"that they may all be one"—is Jesus' prayer for the unity of the church. 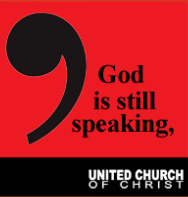 The UCC is one of the most diverse Christian churches in the United States. Explore the many UCC resources at their site.